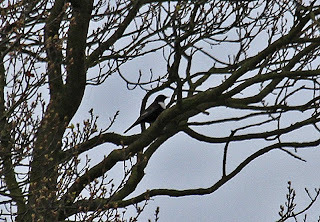 Bob the Birder: Ring Ouzels in Baxterley,North Warks. The plan was to work my way North towards Sutton Coldfield via 'the lakes' - Shustoke, Coton, Kingsbury. Nothing doing at Shustoke so moved on towards Coton but had to do a bit of a uturn when I got a message from Steve Haynes saying that he'd found a Ring Ouzel at Baxterley. The male Ouzel proved quite elusive, rarely emerging from various hedges except to fly to another hedge. Eventually we were able to confirm there were in fact a pair of Ring Ouzels with the female proving even more elusive than the male until later in the afternoon. Wow, I livve in Elmdon. Been catching up with our newly arrived Whitethroats this week. Just found out bouyt these. Are they still there? ?